French onion soup is one of those things that anyone who lives in ski country should cook at least once. Not only is it the stuff people dream of when hunger strikes on the chairlift, but once you see how easily it's made you're bound to whip up future batches freestyle - no matter what your cooking experience - and everyone needs dishes like that in their arsenal. It's quite adaptable to ingredients you have on hand: Don't have beef broth? Just chicken broth will do. Used the last of the vermouth in your morning martini? Use white wine. Don't have good artisan bread? Use rye toast. As long as you follow the one incontestable rule of onion soup - reduce lots and lots of onions down to their deepest, darkest essence before adding broth - your house will fill with a beckoning aroma and your patience will be truly rewarded and appreciated. Thinly slice onions by hand, or in a food processor with slicing blade. Mince garlic cloves. Melt butter in a large dutch oven over medium high heat. When foaming subsides, add onions and garlic and stir to coat well with butter. Season with salt and pepper, keeping in mind that canned stock can be quite salty, so better to under salt at this point. Cook uncovered, stirring regularly, until onions are a deep golden brown. This takes time! The success of the soup depends on well-browned (not burnt!) onions, so don't rush them. 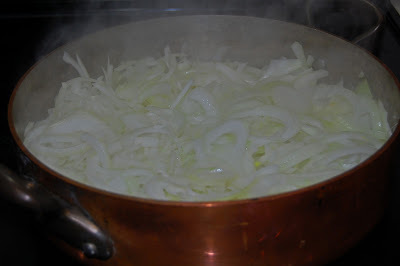 It may take an hour or more to achieve proper browning, depending on the pan used and moisture level of the onions. Once onions are done, sprinkle with flour and stir over heat 3 - 5 minutes to cook the flour a bit and blend well with the onions. Deglaze pan with vermouth, scraping bottom to stir up browned bits; add chicken and beef broths, bay leaf and thyme. Raise heat to bring soup to a boil; then reduce heat immediately to a slow simmer. Check soup for seasoning, cover pot and simmer 30 minutes, stirring occasionally. Meanwhile, toast bread slices and set aside. When soup is ready, set oven to broil. Fill broiler-safe bowls or crocks with hot soup. Float a piece of toast in each bowl. Top toast with grated cheese, being sure to cover toast completely (exposed toast will burn under broiler). Note: This would look nicer in a classic onion soup bowl, or at least a smaller circumference bowl, but since I currently have no place to store said bowls I must soldier on with what I have. Place bowls on a large sheet pan and slide under broiler. Watch carefully and remove from oven when the cheese is melted and beginning to brown in spots. This is one of my all time favorite things to eat. I bet you didn't know that. Can't wait to try.